Over three million people in Ireland own a smartphone and on average check it 57 times per day. Ireland has the highest rate of mobile phone ownership in the EU at 90% with the European average being 88%. When you consider that 52.2% of all web searches are performed on mobile devices it is now mandatory that your website design be mobile responsive. Having a website that is not mobile responsive immediately cuts your target audience in half and those visiting your website will have a negative experience of your service or product offering. 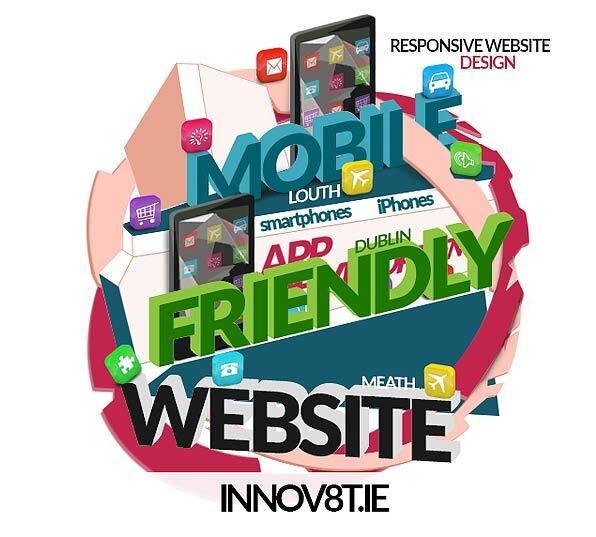 Our Design Team will develop your website with strong user functionality, user-friendly interfaces, with fast content loading in a mobile responsive design. Mobile responsive design makes sure your website automatically resizes its text, images and all to match the screen size of the smartphone, tablet or iPad that it appears on. The main advantages of a mobile responsive design are that is avoids the need for the user to do any unnecessary resizing, scrolling, zooming, or panning that happens when a site is not mobile responsive. It keeps images from being larger than the screen width, and prevents visitors having to pinch to zoom to read your content, which can be very frustrating for the user, who ultimately will leave your website without making any contact with you for your product or service. As a result of this interaction the user will seek the service or product from a competitor and result in a lost opportunity and lost revenue for your business. When your site is mobile responsive it will get preference in the organic search listings of Google above sites that are not mobile responsive. This means with the correct mobile responsive design your site will be much easier to find among the organic lists and as 90% of all users start their internet search in a search engine like Google it is imperative that your website is mobile responsive. To get your web site mobile responsive and increase the traffic, leads and engagements for your business REQUEST A CALLBACK.